Ok Bloggers who use the Blogger platform. Is it just me or is that damn Publish just too close to the save button!! If my brain isn't switched on correctly, I just press the Publish button cause it's all bright and orange and sticking out at me. And then my blog post launches itself off into the blogosphere, usually with just the photos I have uploaded and no supporting text. That's what just happened to me today. I uploaded my photos and meant to click Save then Close and find the time to write up the post a little later, but I hit publish. Doh! Apologies if you clicked through on your reader and just saw the photos, now you can read all the details about these very pretty polishes. 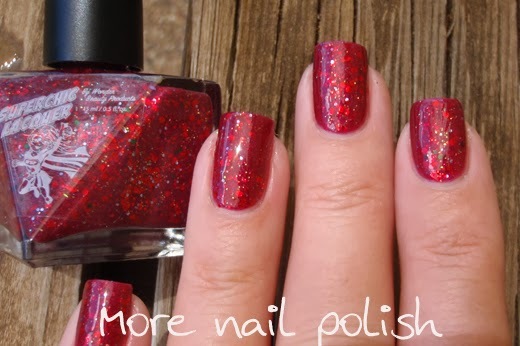 Today I'm showing you my swatches of the holiday collection from SuperChic Lacquer. 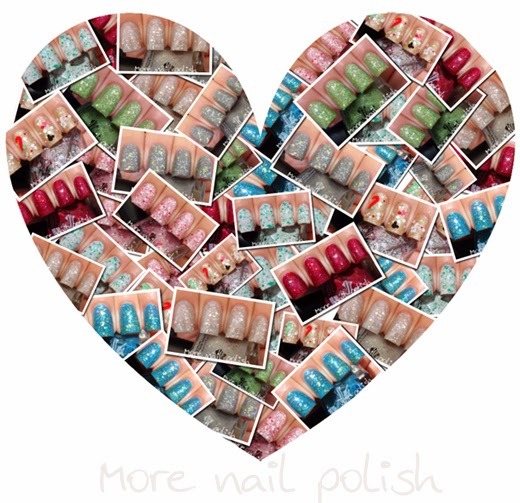 SuperChic is created by Wonder Beauty Products, who also stock a good range of polish making supplies for ladies in the USA. Candycane Magique - a shimmery pink jelly base with a hint of blue color shift, flash of green iridescence, red, silver and white glitters. 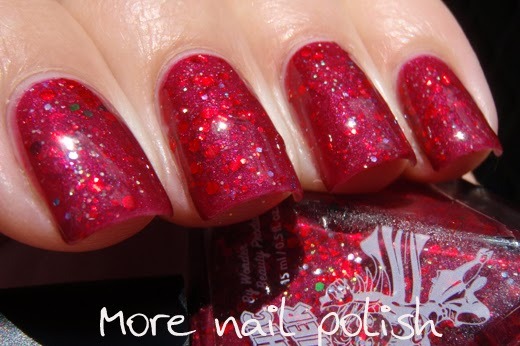 Shown here at two coat with Perfect Nails Shine Top coat..
Christmas Evie - A deep dark red shimmer with red medium glitters, and smaller glitters in purple, gold and green. 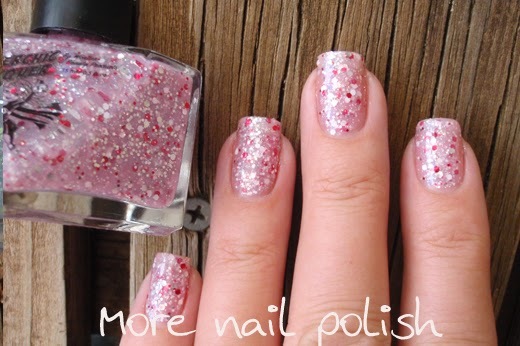 I love the opacity with this, it covered the nail perfectly without hiding the glitters. 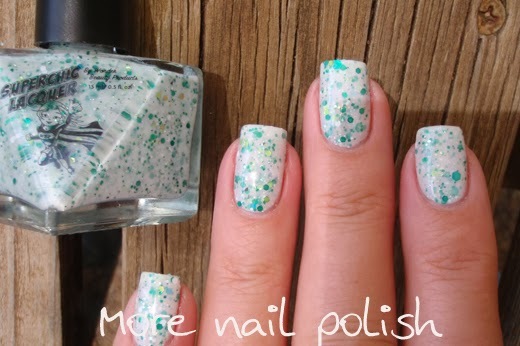 Shown here at two coats with Perfect Nails Shine Top coat..
Icysicle - features a soft white jelly base loaded with varied greens and white glitter in different sizes. The opacity/glitter balance is just perfect on this polish and I love the green and white combo. Shown here at two coats with Perfect Nails Shine Top coat. Mammoth - a greyed out shimmery jelly with plenty of satin finish white glitters in different sizes. 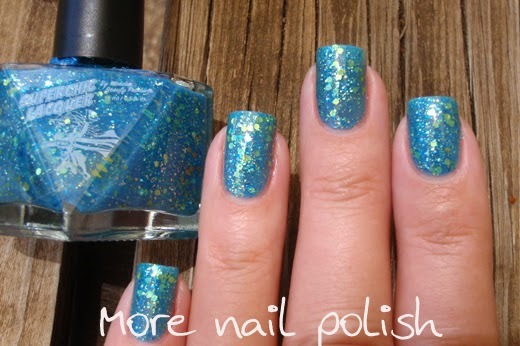 My favourtie part of this polish is all the blue iridescent glitters that just glow from within the polish making it look frost and magical. Shown here at two coats with Perfect Nails Shine Top coat. 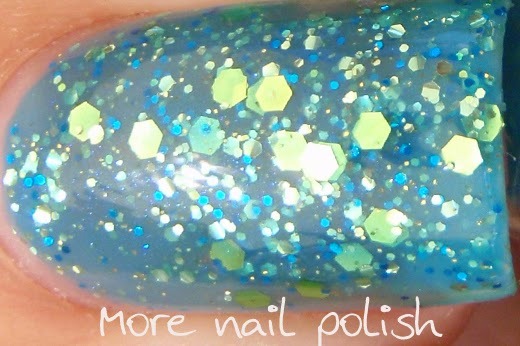 Morphamas - I think Jen describes this polish the best "This is what you get when you morph Hanukkah with Christmas. Very versatile as it represents each holiday traditions, or both, ie: Morph-Ha-Mas! Features an amazing shade of medium blue jelly base, loaded with multi-sized lime green glitters and shimmering green iridescence." This is two coats with Perfect Nails Shine Top coat. 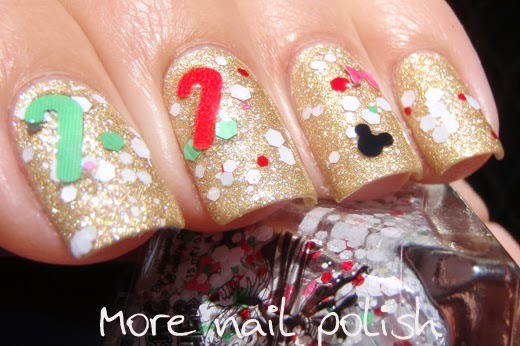 Ugly Sweater Party - Whist this polish may be inspired by an ugly sweater, there is nothing ugly about this polish. 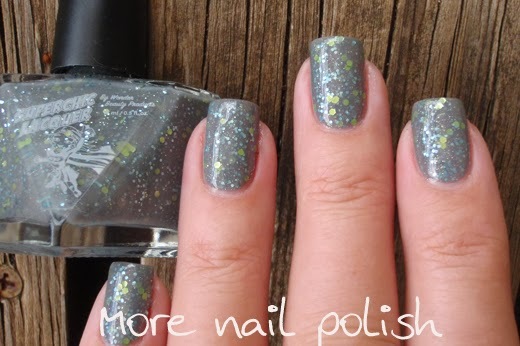 A medium gray jelly base with a generous amount of with lime green and icy blue glitters. I'm wearing two coats with Perfect Nails Shine Top coat. Whoville - Do you know what (or where) Whoville is? It's the fictional town created by Dr Seuss and is the town that appeared in How the Grinch Stole Christmas. This polish is most definitely Grinchy green! An amazing lime green jelly base, chocked full of lime green multi-sized glitters and icey blue smaller glitters. Shown here at two coats with Perfect Nails Shine Top coat. Christmas with Minnie - I'm a sucker for speciality shaped glitters, plus my Miss Two is totally in love with Minnie. We have Minnie Mouse DVDs and she watches Micky Mouse Clubhouse everyday when she wakes up. To say she was a fan of this polish is the understatement of the year. Christmas with Minnie is a clear based topper that has lots of matte white hexes and a light sprinkling of green and red matte glitters. 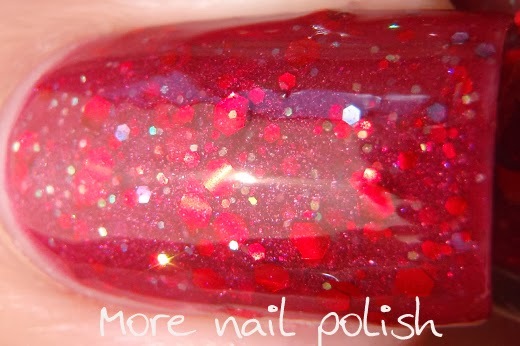 There is also black Minnie head shapes and pink bows in the polish. 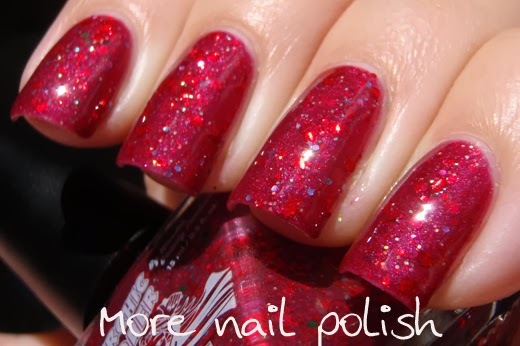 The polish comes paired with a little velvet "Santa bag" containing extra Minnie heads, pink bows and additional matching red and green candy cane glitters. I love that these are provided separately. 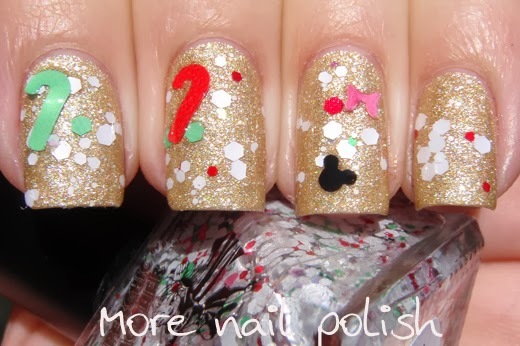 When I applied one coat of Christmas with Minnie I only got white glitters and a few dots of colour - it was actually the exact look I was after, but I didn't get a bow or a Minnie. So I just grabbed my bag of goodies and selected one Minnie, one bow and two candy canes. The candy canes are quite long and stiff, but you can slightly curl them in your fingers to give them a nice nail curve, before pressing them into the wet polish. Not getting sticky polished fingers doing this is another reason why having the specialty glitters loose is a great idea. 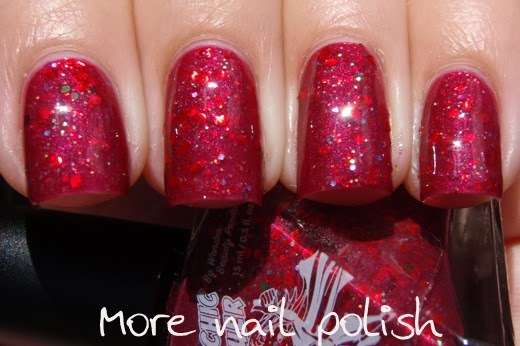 Christmas with Minnie is shown over OPI Music, Angel, Love, Baby. 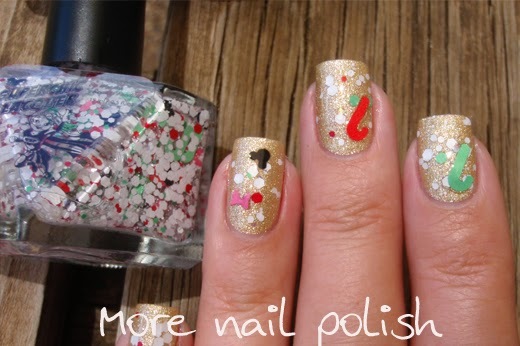 This is a really lovely holiday collection and the formula on all the polishes was really great. SuperChic Lacquer is available from Wonder Beauty Products. Yeah, I've hit that shiny orange publish button on accident way too many times! I'm also very good at hitting sign out instead of publish while leaving a comment, haha. Mine are always scheduled a week in advance-but is your search box working???? Mine really isnt and I don't know if Blogger knows about it? !